The Eight Day Show - and after six years of good weather - bad and good alternating daily. But what scenes! The efforts of getting onto the site in torrential rain; the wonderful displays by the Scammells - five of them heaving their 200 ton trailer through mud and soft ground up and down the slopes of the show. As soon as it was feasable Heavy Haulage steam was doing the same but having to winch each other out of the melee when caught by torrents of rain! ; the defiant line up of Britain's most famous engines on top of the hill; the endless line of show tractors circling the working ones - such scenes are unlikely to be seen again. 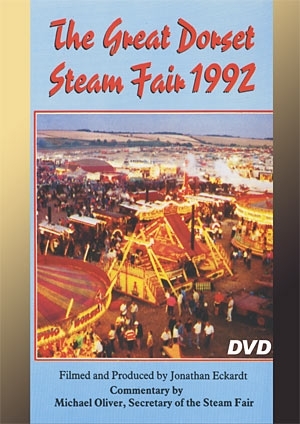 The special theme were the steam products of Tasker of Andover and the tractors and steam engines of Case of America. The only Eight Day Show ever. Extraordinary efforts by five Scammells to move their 200 ton trailer through the mud and soft ground. The entire Heavy Haulage steam having to winch each other out of the mire. Scenes unlikely to be seen again. The special themes - Tasker of Andover & Case of America.